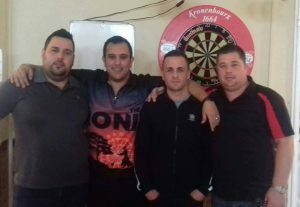 Jarvis, Justin & Sean take the trebles title in an all Mons Calpe Final! Sean Negrette claims his first Youth Ranking Title of the season! Dyson Parody wins his Second Ranking title of the season! GDA Ranking 3 – Carmello Ellul Classic! The third GDA ranking saw a great turn out of 52 players gather up at the Varyl Begg Social Club. The event saw a high standard of play during the night which saw Dyson claim victory over David Francis 6-5 in the final and claim his second ranking title of the season. In the first Quarter-Final game we saw Dyson Parody claim victory over 15 year old Craig Galliano. In this match Craig missed his chances which let Dyson back into the game. Dyson was quick to punish the youngster winning the game 4-2. In the second Quarter-Final game we saw the PDC under 23 qualifier, Jarvis Bautista take on the number two seed David Francis. In this game Jarvis stormed into a 3-1 lead. But it was David who kept his cool wining 3 straight legs to take the match 4-3. In the third Quarter-Final match we saw Dylan Duo taken on another youngster in Ethan Smith. Ethan Smith was quick to settle into the match hitting a 180 on his first throw. Ethan smith hit two high checkouts and quickly stormed into a 3-0 lead. Despite young Smith’s lead Dylan was still able to keep his cool and win the next 4 legs for a 4-3 win. In the fourth Quarter-Final game, Antony Lopez played against, GDA President Tony Dawkins. Both players kept hitting big scores and finishes. This game went to a last leg decider. This saw Antony Lopez take a 4-3 win over Tony. In the semis we saw Dyson face off Antony Lopez. Dyson kept up his brilliant form. He got off to a quick start which gave him an early lead. This resulted in Dyson claiming a 5-1 victory over Antony. In the next semi final we saw Dylan Duo and David Francis face off. Both players got to a flying start. But it was David who managed to check out his finishes rapidly. This resulted in David claiming a 5-2 win over Dylan. 1st leg- Dyson takes out double tops for a 0-1 lead and a break of throw. 2nd leg- Dyson takes out double tops again for a 0-2 lead. 3rd leg- David hit double 4 to hold his throw 1-2. 4th leg- David breaks Dyson’s throw to level the game 2-2. 5th leg- David Francis hits a 180 in the leg and hit double 20 for a 3-2 lead. 6th leg- Davis Francis hits his second 180 of the game and takes out double 16 for the leg 4-2. 7th leg- Dyson finishes the leg on double tops 4-3. 8th leg- Dyson levels 4-4. 9th leg- David hits his 3rd 180 of the match but Dyson manages to take the lead 4-5. 10th leg-Both players hit 180s. David hits his forth of the match, 5-5. 11th leg- Dyson checks out 120 to claim the title. David Francis x8, Dyson Parody x7, Jarvis Bautista x3, Craig Galliano x2, Sean Negrette x2, Antony Lopez x2, Ethan Smith x2, Shaine Israel x1, Christian Tosso x1. Dyson Parody 130 & 120, Jarvis Bautista 120, Antony Lopez 120, Ethan Smith 118,116 & 108, Daran Laker 113, Christian Rosso 112, Sean Negrette 106.